(NARRATOR)>> THERE'S NO NEED TO FEAR! LT AND JEREMY ARE HERE WITH ANOTHER DRIVEWAY RESCUE. THIS TIME THEY'LL BUST UP THIS BRONCO AND REPLACE ALL THE NASTY. PLUS WORK ON "KLASSY KFIVE" GETS EXHAUSTING. THAT AND MORE RIGHT NOW ON TRUCK TECH. (LT)>> WE'VE BEEN GETTING A TON OF ACTION ON OUR LATEST PROMOTION, DRIVEWAY RESCUE. IT'S WHERE YOU GO ONLINE, FILL OUT AN APPLICATION, AND SUBMIT YOUR PROJECT VEHICLE THAT YOU NEED SOME HELP ON, AND ONE OF OUR PARTNERS IS ACTUALLY HERE TODAY, WHO WILL BE PROVIDING ALL THE PARTS WE NEED FOR OUR VIEWER REVIVALS. GUYS MEET TOM TAYLOR, ONE OF THE OWNERS OF ROCK AUTO DOT COM. HEY MAN, THANKS FOR STOPPING BY THE SHOP. WE APPRECIATE YOU BEING A PART OF THIS PROJECT FOR US. (TOM)>> NO, THANKS FOR LETTING US HELP OUT. 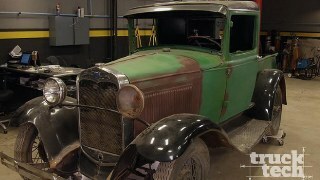 GET A COOL OLD CAR BACK ON THE ROAD. 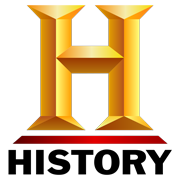 (LT)>> YEAH SO FOR OUR VIEWERS AT HOME WE USE ROCK AUTO DOT COM ALL THE TIME. TELL THEM A LITTLE BIT MORE ABOUT THE COMPANY AND YOUR PHILOSOPHY. (TOM)>> WELL WE'VE BEEN AROUND SINCE '99, AND WE STARTED OUT WITH TWO GOALS AND THEY'RE STILL THE SAME TWO GOALS TODAY. GIVE CUSTOMERS ACCESS TO ALL THOSE PARTS, ALL THAT INFORMATION HIDDEN BEHIND THE TRADITIONAL PART STORE COUNTER. ALL THOSE CATALOGS AND COMPUTERS. LET CUSTOMERS SEE ALL THE PARTS AVAILABLE AND ORDER WHAT THEY NEED, AND TO MAKE IT AFFORDABLE. HAVE RELIABLY LOW PRICES. SO WHETHER IT'S YOUR DAILY DRIVER, OR A CLASSIC CAR, JUST AN OLD CAR, IT'S AFFORDABLE TO KEEP THE CAR ON THE ROAD AND SAFE. 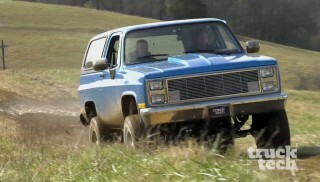 (LT)>> WELL THAT'S PERFECT CAUSE OUR NEXT CANDIDATE HAS AN OLD BRONCO THAT HE WANTS TO KEEP ON THE ROAD. (JOHN)>> HI DRIVEWAY RESCUE. MY NAME'S JOHN BAUGH. THIS IS MY 1994 FORD BRONCO. IT'S AN OLD BORDER PATROL VEHICLE, AND I DROVE IT OUT HERE FROM SAN DIEGO, CALIFORNIA. IT'S THE VEHICLE THAT MY WIFE AND I WENT ON OUR FIRST DATE IN. I'VE KEPT IT MECHANICALLY SOUND BUT IT'S GOTTEN A LITTLE DINGY AND DIRTY OVER THE YEARS. SO I'M LOOKING TO DO SOME COSMETIC FIXES AND GET IT IN A LITTLE NICE CONDITION SO THAT I CAN DRIVE MY WIFE AROUND IN A LITTLE MORE COMFORT. (LT)>> WELL YOU CAN TELL IT'S DEFINITELY A BASE MODEL. VINYL SEAT COVERS, VINYL FLOOR MATS, JUST KIND OF BASIC EVERYTHING, AND THE UPHOLSTERY COULD CERTAINLY USE SOME HELP TOO. (TOM)>> I SEE THE BUMPER'S GOT A FEW DENTS ON IT, THE HEADLIGHTS ARE FOGGED UP. WE HAVE BUMPERS, WE HAVE HEADLIGHT ASSEMBLIES. A LOT OF PEOPLE MAY NOT KNOW THAT ROCK AUTO DOT COM HAS UPHOLSTERY. WE HAVE CARPET, WE HAVE THE LITTLE SWITCHES AND KNOBS THAT YOU MIGHT NEVER THINK YOU'D BE ABLE TO FIND AGAIN. AND THIS VEHICLE'S A GREAT EXAMPLE OF, IT'S A '90'S VEHICLE. WE HAVE PARTS FOR VEHICLES IN THE '80'S AND '90'S, NOT JUST THE NEWEST VEHICLES OR THE CLASSICS FROM THE '60'S. (LT)>> SO I GUESS IT'S TRUE. HOW DOES IT GO? "ALL THE PARTS YOUR CAR WILL EVER NEED"? (TOM)>> THAT'S RIGHT AND YOUR TRUCK TOO. (LT)>> WELL THANK YOU SO MUCH FOR YOUR SUPPORT TOM. (TOM)>> YEAH, THANKS FOR LETTING US HELP OUT WITH THE PROJECT. (LT)>> ABSOLUTELY. WE GOT BUSY BY GOING ONLINE TO RESEARCH PARTS AVAILABLE FOR JOHN'S '94 BRONCO, AND ROCK AUTO DOT COM MAKES IT EASY. NOT ONLY IS THERE A HUGE SELECTION OF ITEMS JOHN NEEDS, LIKE THE FRONT GRILL, HEADLIGHTS, AND SEAT COVERS, BUT MANY HAVE DETAILED PHOTOGRAPHS SO YOU KNOW EXACTLY WHAT YOU'RE ORDERING. A FEW CLICKS AND A COUPLE OF DAYS LATER WE FILLED THE DRIVEWAY RESCUE VAN AND HEADED OUT TO MEET JOHN AND HIS CLASSIC BRONCO. (LT)>> HEY JOHN, HOW ARE YOU, GOOD TO SEE YOU. (JEREMY)>> HEY, HOW'S IT GOING? (LT)>> WELL I'M REALLY DIGGING THE BRONCO. I LIKE THIS CLASSIC GREEN, AND I THINK WE CAN REALLY HELP YOU DRESS THIS THING UP. (JOHN)>> WELL I APPRECIATE YOU GUYS COMING OUT TO HELP ME. (JEREMY)>> YEAH MAN, WELL I THINK YOU'RE GONNA BE REALLY SURPRISED HOW MANY PARTS WE GOT IN THE VAN. SO WHY DON'T WE GET IT UNLOADED AND SEE WHAT WE'RE WORKING WITH. (LT)>> MECHANICALLY JOHN'S TRUCK WAS IN GREAT SHAPE. SO WE DIDN'T HAVE TO GET ANY PARTS FOR THE DRIVELINE, BUT COSMETICALLY IT NEEDED SOME HELP. SO WE GRABBED ONE OF EVERYTHING. (LT)>> RATHER THAN JUST GETTING A COVER THAT WILL HIDE THE TORN SEATS WE'RE ACTUALLY GOING TO COMPLETELY REUPHOLSTER THEM, AND JEREMY'S GONNA SHOW US THAT A LITTLE BIT LATER ON. YOU GET IT OUT YET? (LT)>> MY SIDE'S OUT. YOU GET IT OUT YET? (LT)>> WHAT'S THE HOLD UP? (JEREMY)>> SHUT UP, YOU'RE ANNOYING. (LT)>> I JUST HELP HIM OUT, THAT'S ALL I'M TRYING TO DO. (JEREMY)>> I DON'T UNDERSTAND WHAT YOU'RE EVEN BACK THERE WIGGLING. (LT)>> SO THAT THE THING LOOSENS UP. SEE, GOT IT OUT YET? HERE, FOLD THE SEAT. (JEREMY)>> PULL IT OUT. WHAT'S TAKING SO LONG, ARE YOU STUCK? WHAT ARE YOU DOING? CAN YOU GET IT, YOU WANT TO GET OUT, YOU NEED SOME HELP? ARE YOU STUCK? (JEREMY)>> YOU DO REALIZE THAT YOU'RE GONNA, OKAY. THERE YOU GO. GONNA HAVE TO TURN IT. (LT)>> IT'S LIKE HAVING A LITTLE BROTHER AGAIN. (JEREMY)>> IT TOOK HIM A MINUTE BUT HE GOT IT. (LT)>> I'M SORRY MARK FOR THAT COMMENT. I LOVED YOU AS A LITTLE BROTHER. (JEREMY)>> THAT'S NOT WHAT I HEARD. (LT)>> COME ON, GRAB THAT. (JEREMY)>> NO, WAIT. LET ME SHOW YOU WHAT YOU JUST DID TO ME. THIS IS WHAT LT DID TO ME. ALWAYS HURTING ME. (LT)>> YOU'VE GOT LITTLE GIRL HANDS. (NARRATOR)>> NEXT ONE BRONCO REBIRTHED. (LT)>> WE'RE BACK HELPING OUT OUR VIEWER JOHN FRESHEN UP HIS '94 BRONCO. HE'S KEPT IT MECHANICALLY SOUND THROUGH THE YEARS, BUT IT'S THE COSMETIC STUFF THAT'S GONE TO THE DOGS. LIKE CLOUDY HEADLIGHTS, DENTED FRONT AND REAR BUMPERS, AND AN INTERIOR THAT CAN ONLY BE DESCRIBED AS NASTY. CERTAINLY SMELL A LOT BETTER AFTER THIS. (JOHN)>> HAVING JEREMY AND LT OUT HERE MEANS THE WORLD TO ME. THEY'RE GETTING ME OFF TO A REALLY GREAT START. I'M TAKING CARE OF SOME OF THE TRICKIER THINGS I DON'T I COULD HANDLE ON MY OWN. ALSO MY WIFE IS REALLY APPRECIATIVE BECAUSE SHE'S GONNA FEEL A LOT MORE COMFORTABLE. SHE'LL DEFINITELY BE IN THE TRUCK A LOT MORE OFTEN BECAUSE OF THESE GUYS. (JEREMY)>> WHILE LT FINISHES RIPPING OUT THE INTERIOR I'M GOING TO GET STARTED TEARING DOWN THE SEATS, STARTING WITH THE FRONT BUCKETS. THIS PROCESS IS PRETTY STRAIGHT FORWARD. JUST REMEMBER, KEEP UP WITH THE HARDWARE. THESE ARE REALLY, REALLY DELICATE. SO MAKE SURE THAT WE DON'T BREAK THAT. BEFORE THE BUCKETS ARE RECOVERED I FIRST HAVE TO SEPARATE THE SEAT FROM THE BACK REST, AND THEN REMOVE THE SLIDER. ALL RIGHT, WHAT'S NICE ABOUT SOME OF THESE LATER MODEL TRUCKS, EVEN THOUGH THAT IS EARLY '90'S, IT'S STILL LATER, IS THE FACT THAT THEY DON'T USE HOG RINGS. THEY USE WHAT'S CALLED A LISTING. SO IT'S A PIECE OF PLASTIC THAT HAS A CHANNEL THAT'S SEWN ON TO THE SEAT COVER AND IT JUST CLIPS RIGHT IN. MAKES LIFE A LOT EASIER WHEN YOU'RE DOING UPHOLSTERY WORK. (LT)>> AND WHILE JEREMY CONTINUES TO WORK ON THE SEATS, JOHN AND I GET BUSY WITH THE TEAR OUT. DID YOU KNOW THAT YOUR TRUCK WAS INVOLVED IN A FIRE FIGHT OF SOME SORT? THERE'S A BULLET HOLE IN THE FLOOR. (JOHN)>> I'LL BE, SOMETHING SHOT THROUGH BOTTOM OF THERE. SHE'S ALMOST THERE, JUST A COUPLE MORE TURNS. I LOVE THIS TRUCK. EVERY KID'S HAD A TONKA TRUCK WHEN THEY WERE SMALL AND THIS IS WHAT IT IS TO ME. IT'S A TONKA TRUCK THAT I HAD WHEN I WAS A LITTLE KID, AND THAT'S ONE OF THE THINGS I REALLY LIKE ABOUT IT. 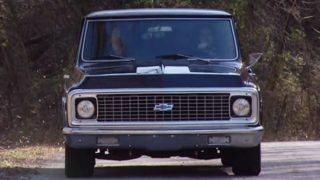 (LT)>> YOU'D THINK RESTORATION PARTS FOR AN OLD BRONCO WOULD BE HARD TO COME BY, BUT A FEW CLICKS ONLINE AT ROCK AUTO DOT COM... IT'LL LOOK NICE. ...AND WE FOUND EVERYTHING FROM A SHINY NEW GRILL, TO BRAND NEW FRESHLY CHROMED BUMPERS, AND ALL THE IMPACT STRIP INSERTS. MATTER OF FACT, THIS BUMPER WITH ALL NEW INSERTS STILL COST LESS THAN HALF OF WHAT YOU'D HAVE TO PAY TO GET A BUMPER REPAIRED AND RECHROMED. SO REALLY ALL WE'RE TRYING TO DO IS JUST MAKE SURE THAT THE GAP BETWEEN THAT FILLER PANEL AND THE BUMPER IS LEVEL, AND IT LOOKS PRETTY DARN CLOSE. I THINK THIS SIDE NEEDS TO GO UP JUST A HAIR, OR IF WE'RE MAXED OUT ON THE ADJUSTMENT WE'LL BRING THAT SIDE DOWN JUST A HAIR, BUT WE'RE PRETTY CLOSE. I'LL TELL YOU WHAT. THAT'S LOOKING PRETTY GOOD JUST FOR A BUMPER, A COUPLE PIECES OF TRIM, AND SOME LIGHTS. GOOD ONE DAY MAKEOVER, HUH? (JEREMY)>> NOW WE'VE GOT THE OLD SEAT COVERS OFF AND AS I THOUGHT, THE FOAM IS STILL IN REALLY NICE SHAPE. IT'S GOT A LOT OF LIFE LEFT TO IT. SO WE'RE NOT GONNA HAVE TO REPLACE THAT, BUT WE ARE GOING TO ADD THESE VELOUR SEAT COVERS. NOW BACK IN '94 THIS WOULD HAVE BEEN UPGRADE OVER THE VINYL THAT WAS IN THE TRUCK. SO I'LL SHOW YOU A COUPLE OF TRICKS HOW TO GET THESE ON. GRAB THE BAG YOUR NEW COVERS CAME IN, OR A GARBAGE BAG OR SOMETHING, AND LAY IT OVER THE BACK. WITH THE VELCRO COVERED, THE NEW MATERIAL SLIPS ON WITHOUT GETTING CAUGHT. ALL RIGHT, SO THAT MADE IT REALLY EASY. SO THE NEXT THING I NEED TO DO IS TRY TO RIP THE BAG OUT OF HERE. THAT WAY WE CAN STICK THE SEAT COVER DOWN TO THE VELCRO. NOW YOU DON'T HAVE TO GET IT ALL OUT HERE BUT YOU WANT TO GET THE MAJORITY OF IT. NOW IF YOU DON'T HAVE A BAG. LIKE IF YOUR SEAT COVERS WEREN'T SHIPPED IN IT, YOU CAN ALSO USE SOMETHING LIKE A TRASH BAG. THAT WORKS REALLY WELL. ALL RIGHT, LET'S SEE IF CAN STILL GET SOME MORE OF THIS PLASTIC OUT OF HERE, BUT YOU DON'T HAVE TO WORRY ABOUT GETTING IT ALL OUT. DON'T WORRY ABOUT IT. IT'S NOT GONNA MAKE ANY NOISE OR ANYTHING LIKE THAT BECAUSE BELIEVE IT OR NOT FROM THE FACTORY THAT'S HOW THEY ACTUALLY INSTALLED THESE SEAT COVERS. MAKES IT REALLY EASY. AND VERY EASY. ALL RIGHT, FOR THE BOTTOM CUSHION WE'RE GOING TO DO THAT A LITTLE BIT DIFFERENT. INSTEAD OF JUST TRYING TO SLIDE THE COVER OVER THE CUSHION THE FIRST THING WE WANT TO DO IS TURN THE COVER INSIDE OUT. ONCE WE GET IT INSIDE OUT, I JUST WANT TO CENTER IT UP ON THE CUSHION, STICK IT DOWN. NOW THAT WE'VE GOT IT STUCK DOWN WE CAN JUST START ROLLING OVER THE EDGES. ALL RIGHT, IT'LL FIGHT WITH YOU A LITTLE BIT BUT IT'S NOT TOO BACK. ONE THING YOU WANT TO BE CAREFUL WITH, IF YOU FEEL A LOT OF TENSION ANYWHERE YOU MAY WANT TO PICK IT BACK UP AND REPOSITION IT BECAUSE YOU DON'T WANT TO TEAR THE STITCHES. BUT FOR THE MOST PART IT SHOULD FOLD OVER PRETTY EASY. ONCE WE'VE GOT THAT WE CAN JUST FOLD OUR LISTINGS OVER, CONNECT THEM TO THE SEAT FRAME. SO I'D SAY ALL IN AFTER PULLING THE SEAT OUT, RIPPING THE OLD COVER OFF, PUTTING A NEW ONE ON, ABOUT 20 MINUTES. (JEREMY)>> DOWN A LITTLE MORE. 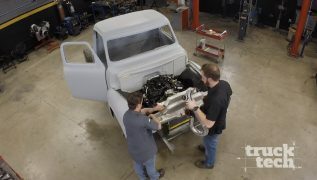 (JOHN)>> THE GUYS NAILED IT ON THE PARTS THAT THEY CHOSE FOR THE TRUCK. I LIKE THE CHROME THAT THEY CHOSE. I WANTED TO KEEP THE CHROME. I THINK IT HELPS OUT A LOT. THE INTERIOR, GOING FROM BROWN OR TAN TO THE BLACK INTERIOR'S PERFECT FOR MY PURPOSES. I'M REALLY HAPPY WITH EVERYTHING THEY CHOSE. (KATHLEEN)>> I THINK THE TRUCK TURNED OUT AMAZING. IT'S BEAUTIFUL! I LOVE THE FRONT, INTERIOR'S FANTASTIC. I CAN ACTUALLY SEE OVER THE HOOD NOW TO DRIVE IT. SO I CAN'T WAIT TO DRIVE IT. (JOHN)>> HEY LT, THANKS A LOT. WE APPRECIATE ALL YOUR HARD WORK. (LT)>> WE HAD A BLAST DOING IT. (KATHLEEN)>> THANK YOU SO MUCH FOR COMING OUT AND HELPING US OUT. RESCUING US! (JEREMY)>> CONTINUE TO DRIVE THE WHEELS OFF OF IT. (NARRATOR)>> NEXT, OUR SQUARE BODY RETURNS! (JEREMY)>> OUR KFIVE HAD BEEN ON THE BACK BURNER FOR QUITE SOME TIME, BUT IN THE PAST LITTLE BIT WE'VE MADE A TON OF PROGRESS ON IT. WE'VE GOT EVERYTHING PAINTED AND WE'VE GOT A COLOR MATCHED BED LINER IN THERE. SHE'S LOOKING REALLY COOL, BUT TODAY WE'RE GONNA SPEND A LITTLE BIT OF TIME WITH OUR POWERTRAIN. (LT)>> SOME TIME AGO WE INSTALLED A 454 BIG BLOCK CHEVY, AND TO IT WE ATTACHED A PRO CHARGER DONE. NOW WE HAVE A HORSEPOWER GOAL OF SOMEWHERE AROUND 550 TO 600 HORSE. TODAY WE NEED TO BUILD AN EXHAUST, AND MOST OFF THE SHELF SYSTEMS THAT YOU'LL GET ARE ONLY TWO AND A HALF INCHES, AND THAT'S JUST NOT GONNA CUT IT FOR THE AMOUNT OF HORSEPOWER THAT WE WANT TO PUSH. (JEREMY)>> SO I GUESS THAT MEANS TODAY WE'RE GONNA DO A LITTLE FAB WORK. 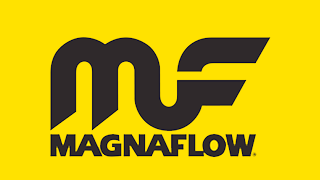 (LT)>> ALL THIS WEEK WE WERE FORTUNATE TO HAVE MAGNAFLOW'S MASTER BUILDER, RICHARD WAITUS, NEXT DOOR IN ENGINE POWER. 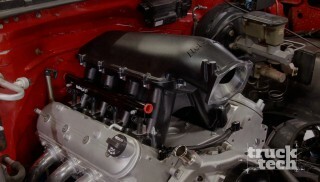 HE CREATED A CUSTOM EXHAUST FOR MIKE AND PAT'S TRIPLE THREAT CAMARO, AND BECAUSE OF THE AFTERMARKET CHASSIS RICHARD UTILIZED A MAGNAFLOW THREE INCH BUILDERS KIT TO GET THE JOB DONE. I MENTIONED TO HIM OUR KFIVE PROJECT AND HE SAID HE'D SAVE SOME TIME FOR US AS WELL. WELL RICHARD HERE'S THE BLAZER. WHAT DO YOU THINK? (RICHARD)>> A LOT MORE ROOM. (JEREMY)>> YEAH WE FIGURED THIS WOULD BE A LITTLE EASIER TO WORK ON. (LT)>> YEAH I MEAN SHE'S GOT ABOUT FOUR INCHES OF LIFT ON IT, 35'S. THE THING'S SITTING WAY UP IN THE AIR. BASICALLY WE'VE GOT THE HEADERS IN PLACE. PROBABLY A MUFFLER SOMEWHERE BACK HERE. WE WANT TO DO SOMETHING A LITTLE BIT DIFFERENT AND RUN A SINGLE TAIL PIPE. (RICHARD)>> WELL THE YPIPE CONFIGURATION'S GOOD. IN A LOT OF CASES TWO HELPS JUST TO BALANCE. IF YOU'RE NOT GONNA PUT AN "X" OR A TRUE DUAL WITH AN "H" PIPE OR SOMETHING, IT HELPS WITH POWER BUT ALSO GIVES IT A NICE, CLEAN SOUND. AND FOR PACKAGING SAKE, WHILE WE ARE GIFTED WITH A LOT OF SPACE DOWN HERE, WE'RE RUNNING BIG TUBING. SO THE LESS BENDING WE HAVE TO DO THE CLEANER IT'S GONNA LOOK. AND ULTIMATELY SINCE WE ARE USING MANDREL BENDS WE'RE NOT TOO WORRIED ABOUT THE BENDING, BUT AGAIN IT'S ALL EXPOSED. 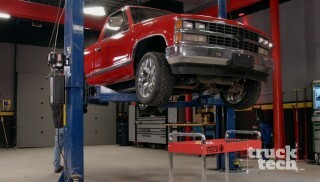 WE'VE GOT SOME MUCH LIFT ON THIS THAT YOU'RE GONNA SEE EVERYTHING ON THE UNDERBODY. WE WANT IT TO LOOK AS GOOD AS IT'S GOING TO PERFORM. (LT)>> ALL RIGHT, WELL WE'LL LEAVE THAT ALL UP TO YOU. LET'S GO CHECK OUT SOME PARTS. (JEREMY)>> LET'S GO. MAN YOU BROUGHT A LOT OF GOODIES. (RICHARD)>> YEAH, WELL YOU GUYS KIND OF GAVE ME AN IDEA OF WHAT YOU'RE WERE LOOKING FOR, AND HOW TO GET YOU SOMETHING THAT WAS BIGGER THAN THE TRADITIONAL TWO AND A HALF INCH EXHAUST AND DUAL SETUPS THAT GO IN HERE BECAUSE YOU ARE RUNNING BETWEEN WHAT, 550, 600 HORSE YOU SAID? (LT)>> YEAH REALLY THAT'S THE GOAL WE'RE SHOOTING FOR. (RICHARD)>> GOT YOU, SO WITH THAT GOING INTO DUAL TUBE WE WANT TO START WITH ABOUT A DUAL THREE INCH, AND THEN BEING THAT YOU ALSO SAID YOU WANTED TO GO INTO A SINGLE TAIL PIPE WE NEED SOMETHING THAT CAN SUPPORT THAT AS WELL. SO WE HAVE A FOUR INCH FOR THE TAIL PIPE. (LT)>> NOW TALKING ABOUT HORSEPOWER AND DIAMETERS, WITH THE DUAL THREE INCH HEAD PIPES WHAT IN THEORY COULD THAT SUPPORT IF WE WANTED TO MAKE A SMALLER PULLEY ON THE CHARGER AND BOOST IT UP JUST A LITTLE MORE? (RICHARD)>> WE DEFINITELY THE THREE INCH IS GONNA GET YOU TO OR AT THAT 500, 550 MARK WITH ZERO LOSS TYPE OF SITUATION, BUT IF YOU'RE REALLY LOOKING AT WICKING IT UP AND PUSHING EVEN HARDER YOU MIGHT BE BETTER OFF TO GO LIKE A THREE AND A HALF IF YOU REALLY NEED THAT LAST BIT OF POWER, BUT REALISTICALLY SPEAKING WITH OBVIOUSLY THE TYPE OF TRUCK WE'RE WORKING WITH AND A 10TH OF A SECOND NOT REALLY BEING WHAT YOU'RE AIMING FOR, YOU'RE GONNA HAVE OVERALL A BETTER DRIVABLE MID RANGE AS WELL AS A SOUNDING VEHICLE IN A SMALLER DIAMETER TUBE SIZE. (JEREMY)>> WELL THERE'S ONE THING I NOTICED. I'M A GUY THAT I LIKE TO MAKE THINGS LOOK GOOD, AND LT, HE LIKES TO MAKE THINGS GO FAST, I GET IT, BUT I DON'T THINK I WANT TO RUN THE TIP. WHAT DO YOU THINK ABOUT THAT? (RICHARD)>> WELL IT'S A TOUGH DECISION BUT AT THE END OF THE DAY I MIGHT BE ON YOUR SIDE IN THIS JUST BECAUSE IF THERE ISN'T A PURPOSE FOR IT I THINK THE EXHAUST SYSTEM'S SUPPOSED TO ACCENT THE REST OF THE VEHICLE. BUT IF IT'S A PRIMARY FEATURE AND IT DOESN'T HAVE A PLACE TO BE, SOMETIMES BETTER HEARD AND NOT SEEN WHEN IT COMES TO EXHAUST. (LT)>> WELL I GUESS THE NO'S HAVE IT, BUT WE'LL LET YOU GET TO IT. (NARRATOR)>> NEXT, FROM TWO INTO ONE! (LT)>> WE'RE BACK ON TRUCK TECH, WHERE RICHARD FROM MAGNAFLOW IS CREATING A CUSTOM EXHAUST FOR OUR FULL SIZE BLAZER. WHEN HE'S NOT MANNING THE TIG OR CHOP SAW, HE'S RUBBING SHOULDERS WITH THE LIKES OF MARIO ANDRETTI, RICHARD PETTY, AND CHIP FOOSE WHILE COORDINATING MAGNAFLOW'S MARKETING STRATEGIES AND THEIR HUGE PRESENCE AT THE SEMA SHOW. (RICHARD)>> YOU KNOW I'VE BEEN DOING THIS ABOUT 15 YEARS AND I STILL SAY I ENJOY THIS THE MOST. IT'S THE PART OF GETTING OUT UNDERNEATH THE VEHICLES, WORKING. THERE'S A LOT OF WHAT I DO IN THE INDUSTRY THAT'S SITTING BEHIND A DESK OR JUST TALKING TO SOME OF THE PEOPLE, BUT THIS IS WHERE YOU'RE GONNA KEEP YOUR SKILLS HONED, AND IT'S ACTUALLY A GOOD RELEASE. SOMETHING YOU CAN DO PHYSICALLY, AND SEE WHAT'S IN YOUR HEAD ACTUALLY COME OUT TO REALITY. SO AS I'M ASSEMBLING THE EXHAUST SYSTEM YOU'RE GONNA SEE THAT I INSTALL A PART AND I REMOVE IT SEVERAL TIMES. PART OF THAT PROCESS IS TO MAKE SURE THAT EACH PIECE AND SEGMENT, AS IT'S LINED UP, CONTINUES TO LINE UP AS YOU GET FROM FRONT TO BACK. ONE OF THE THINGS YOU'LL NOTE AS WELL. YOU COULD PROBABLY ASSEMBLE THE ENTIRE SYSTEM JUST TACK WELDING IT, BUT ONE OF THE DOWN FALLS OF THAT IS IF YOU EVER REMOVE THE PIPE AND HIT SOMETHING ON THE WAY DOWN. GOD FORBID YOU DROP. YOU MAY END UP UNDOING ALL THE WORK. SO YOU'LL SEE MOST OF THE TIME I TAKE THIS BACK TO THE BENCH AND SEAM WELD EACH PART TO MAKE SURE THAT IT'S JUST NOT GONNA MOVE. EVERY EXHAUST SYSTEM POSES ITS OWN OBSTACLES. SOME BEING EASIER, SOME BEING MORE COMPLICATED. THE TRUCKS IN GENERAL TYPICALLY GIVE US A LOT OF SPACE IN AN "H" FRAME. SO IT'S OBVIOUSLY A BREATH OF FRESH AIR TO COME OUT AND ACTUALLY RUN A SYSTEM THAT CAN AESTHETICALLY BE JUST AS PLEASING TO ADMIRE, NOT JUST FUNCTIONAL ABOUT WHERE THE PATH OF LEAST RESISTANCE IS TO GET THE PIPES FROM BEGINNING TO END. ALL RIGHT, SO NOW WE HAVE THE MUFFLER FITTED TO THE PIPES, AND AS YOU CAN SEE, THE PIPE PROFILE WAS MADE SO THAT WE DIDN'T HAVE ANY CLEARANCE ISSUES AROUND ANYTHING THAT MOVES, BUT MORE OR LESS ANYTHING THAT WAS SENSITIVE TO HEAT. SO NOW TO THE TAIL PIPE. SO WHILE A FOUR INCH TAIL PIPE SEEMS A LITTLE BIT ODD IN MOST APPLICATIONS, HERE WE ARE WORKING WITH A SUPERCHARGED VEIGHT, AND ON TOP OF THAT WE'RE FEEDING A DUAL THREE INCH SYSTEM INTO IT. 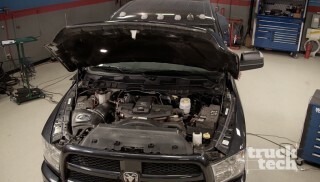 SO TO ACCOMMODATE THE PROPER AIR VOLUME TO MAKE THAT ENGINE BREATHE CORRECTLY, WHILE FOUR INCH LOOKS BIG IT'S ABSOLUTELY THE RIGHT CHOICE FOR THIS TRUCK. (LT)>> ALL RIGHT RICHARD, THANK YOU SO MUCH FOR COMING OUT AND HELPING US OUT. THIS IS DEFINITELY A BEAUTIFUL EXHAUST. (RICHARD)>> IT'S A PLEASURE AS ALWAYS COMING OUT HERE AND GETTING TO SEE ALL THESE COOL PROJECTS YOU GUYS WORK ON. (LT)>> WELL I REALLY LIKE HOW YOU START AT THE HEADERS. KIND OF WENT UP AND OVER THE CROSS MEMBER. THAT'S A LITTLE BIT DIFFERENT BUT IT LOOKS REALLY CLEAN AND SANITARY, AND THEN JUST THE SINGLE TAIL PIPE ON A BLAZER LIKE THIS. 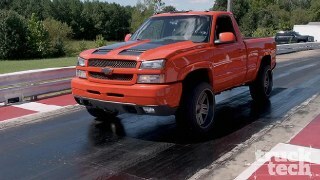 IT JUST SETS THE TRUCK APART FROM THE CROWD AND HAS A REALLY DISTINCTIVE LOOK TO IT. (RICHARD)>> WELL I CAN'T WAIT UNTIL YOU GET HERE FIRED UP. SO YOU'RE GONNA HAVE TO SEND ME A SOUND CLIP OR SOMETHING AND LET ME HEAR IT FROM HOME. (LT)>> YEAH, I'VE GOT A LITTLE BIT MORE WORK TO DO AS FAR AS WIRING STUFF, BUT I'LL DEFINITELY DO THAT. (LT)>> IT'S AN EVERYDAY OCCURRENCE TO HAVE A FASTENER THAT'S STUCK AND YOU NEED AN IMPACT GUN TO GET IT OUT, AND TRADITIONAL DESIGNS CAN BE BULKY AND DIFFICULT TO FIT IN THE CONFINES OF A MODERN ENGINE BAY. MATCO TOOLS HAS A SOLUTION WITH THEIR ANGLED IMPACT WRENCHES. IT'S A LIGHTWEIGHT AND COMPACT DESIGN, AND THERE ARE THREE POWER LEVELS IN FORWARD, AND YOU GET ONE FULL POWER SETTING IN REVERSE TO BACK OUT THOSE STUBBORN BOLTS. NOW IT'S A GEARLESS DESIGN, WHICH INCREASES TORQUE PERFORMANCE BY 20 PERCENT, AND IT REDUCES VIBRATION. GRAB YOURS FROM YOUR LOCAL MATCO TOOLS DISTRIBUTOR OR BY VISITING MATCO TOOLS DOT COM. (JEREMY)>> IF YOU USE YOUR TRUCK FOR WORK, PLAY, OR BOTH, THEN YOU KNOW HOW NASTY AND BEAT UP YOUR INTERIOR CAN GET. SO TO PROTECT YOUR SEATS COVERCRAFT OFFERS SEAT PROTECTORS IN A WIDE RANGE OF COLORS AND FABRICS. THEIR SEAT SAVES ARE AVAILABLE FOR FRONT AND REAR ROWS. THEY OFFER WATERPROOF MATERIAL OPTIONS, AND YOU CAN EVEN GET PRIME ONE CAMO. AND FOR THAT EXTRA TOUGH PROTECTION YOU CAN ALSO GET CUSTOM FIT CARHARTT MATERIAL FOR YOUR RIG. SO TO PRESERVE YOUR SEATS AND TO FIND OUT MORE CHECK OUT COVERCRAFT DOT COM, AND FOR MORE INFORMATION ON OUR SHOW GO TO POWERNATION TV DOT COM. 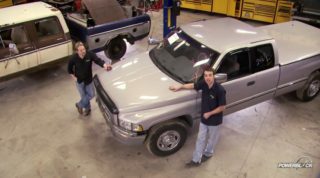 THANKS FOR WATCHING TRUCK TECH. WE'LL SEE YOU NEXT TIME.